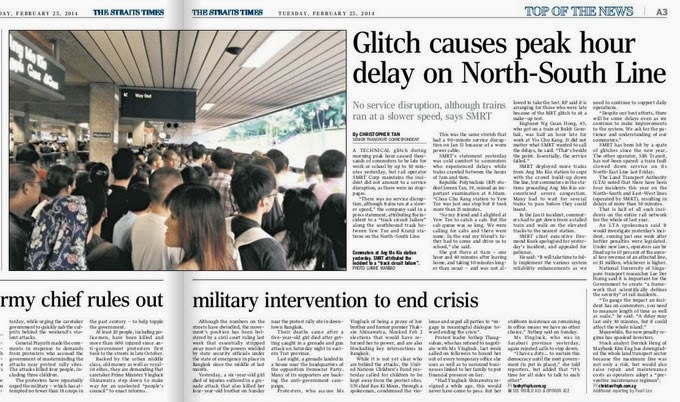 From the ST report you could tell that SMRT isn't as worried about commuters than if the incident yesterday on the North-South line should be billed as a disruption or delay. Bear in mind many polytechnic students were late for their exams as a result of this incident but I don't think they were even aware or cared. On Feb 13, Christopher Tan wrote an article I wanted to blog about but didn't have the time: Reliability of MRT key to having fewer cars on roads. In that piece Christopher Tan shared with readers about the bet he had with a senior civil servant on the reliability of our trains. Yesterday mrt incident suggests that the civil servant has lost the bet. I want to remember these statistics from the article. For instance, breakdowns on the 125-year-old, 340km, 24-hour New York City subway average one every 260,000km operated. Singapore's 25-year-old, 180km network breaks down once every 120,000km. Let's not even compare with the appropriate peer to us which is Hong Kong MTR. We can't even do better then New York! Yesterday incident was yet another annoying reminder. Desmond Kuek and the board must surely feel like farmers living under unpredictable weather. They have in the short term very little control over the reliability of the train system. The hefty fines the regulator could impose on them is not going to help make things better. If circumstances eventually cause LG Kuek to be ousted from his job, I think the only guys that would be willing to do it are those with nothing to lose. In other words those who would surely fail at the task. In a perverse way we will return to square one with the government of the day getting the blame. After all they are the ones who let in so many people into this tiny place and cause the system to become overloaded. With a reliable train system years away, meanwhile SMRT can do no better than empathize and really connect with commuters. LG Kuek asking commuters to be patient is just not good enough. I am sure he would have visited injured soldiers in hospital as CDF, so what is the equivalent here?